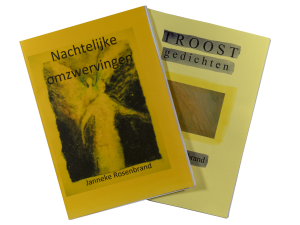 Janneke has made a number of poetry collections, always with 21 poems. of course, all poems are in the Dutch language. Her last bundle ‘ Ik ben er nog’ appears to be a harbinger of her impending illness. This poetry collection also includes a number of notable poems. Her earlier poems are thematically organized. A separate collection are the Consolation poems (Troostgedichten) and Nightly wanderings (Nachtelijke omzwervingen). The latter consists of 7 poems and 7 art reproductions, chosen by Janneke from her own paintings. 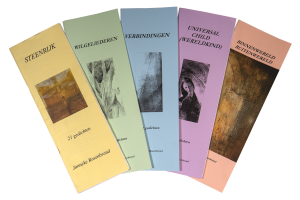 All poetry collections costs €10,– each and can be ordered via Uitgeverij Aan de Tijd.